Balhae (698 - 926) (Bohai in Chinese) existed as an ancient kingdom established after the fall of Goguryeo. After Goguryeo's capital and southern territories fell to Unified Silla, Dae Jo-young, a former Goguryeo general of possible Mohe ethnicity, established Jin (振, Chinese, Zhen), later called Balhae, by uniting various Mohe and Goguryeo elements. Balhae emerged as the successor state to Goguryeo. Balhae occupied southern parts of Manchuria (Northeast China) and Primorsky Krai, and the northern part of the Korean peninsula. The Khitans defeated Balhae in 926, becoming mostly a part of the Liao Dynasty while Goryeo absorbed southern parts. Balhae stands in the direct line of the mythical foundation of Korea in Dangun (2333 B.C.E.) and legendary foundation in Gija (1222 B.C.E.). Controversy boils between Chinese, North Korean, and South Korean archaeologists and anthropologists over the origin of the northern kingdoms, including Balhae. Many Chinese scholars claim Balhae and previous kingdoms as provinces of China whereas many Korean scholars claim indigenous roots for the northern Korean people. The argument has political overtones as a way to lay claim to the territory of former Gojoseon, Goguryeo, and Balhae. Regardless, the influence of China upon northern Koreans has been pronounced. The earliest extant recorded mention of Balhae come from the Book of Tang, compiled between 941 to 945. Southern Manchuria(Northeast China) and northern Korea existed previously as the territory of Goguryeo, one of the Three Kingdoms of Korea. Goguryeo fell to the allied forces of Silla and the Tang Dynasty in 668. The Tang annexed much of western Manchuria, while Silla unified the Korean Peninsula south of the Taedong River and became Unified Silla. The "New Book of Tang" recorded that the founder of Balhae, Dae Joyeong (大祚榮) had served as a Goguryeo general of Sumo Mohe stock. According to the "Book of Tang," Dae Joyeong belonged to a minority tribe in Goguryeo. And the Memorabilia of the Three Kingdoms (i.e., Samguk Yusa) written several hundred years later states that he had Goguryeo lineage. The second king Mu, who felt encircled by Tang, Silla and Black Water Mohe along the Amur River, attacked Tang and his navy briefly occupied a port on the Shandong Peninsula in 732. Later, Tang and Balhae forged a compromise resuming tributary missions to Tang. He also sent a mission to Japan in 728 to threaten Silla from the southeast. Balhae kept diplomatic and commercial contacts with Japan until the end of the kingdom. Because of its proximity to many powerful states, Balhae became a buffer zone for the region. The third king Mun expanded its territory into the Amur valley in the north and the Liaodong Peninsula in the west. He also established Holhanseong, the permanent capital near Lake Jingpo in the south of today's Heilongjiang province around 755. During his reign, Balhae established a trade route with Silla, called Sillado. By the eighth century, Balhae controlled northern Korea, all of Northeastern Manchuria(Northeast China), the Liaodong peninsula, and present day Primorsky Krai of Russia. Balhae's strength forced Silla to build a northern wall in 721 as well as maintain active defenses along the common border. Traditionally, historians believed that the ethnic conflicts between ruling Koreans and underclass Malgal weakened the state. Recent study suggests that the catastrophic eruption in the tenth century of Baekdu Mountain located at the center of Balhae territory led to the downfall of Balhae. Baekdu mountain still has one of the biggest volcanic caldera in the world Heaven Lake. Ashes of that eruption can still be found in a large area, even in a sedimentary layer in northern Japan. That massive explosion created tremendous volcanic ash, damaging agriculture and even societal integrity. The Khitans took advantage of that natural disaster. Eventually, Balhae succumb to the Khitans, an emerging power in the Liaoxi area (east of current Beijing area). After destroying Balhae in 926, the Khitan established the puppet Dongdan Kingdom, followed shortly thereafter by the annexation by Liao in 936. Liao moved some Balhae aristocrats to Liaoyang but Balhae's eastern territory remained politically independent. Some Balhae people including aristocrats (est. one million), led by the last Crown Prince Dae Gwang-Hyun (대광현), fled southward to Goryeo, the new self-claimed successor of Goguryeo (934). Many descendants of the Balhae royal family in Goryeo, changed their family name to Tae (태,太) while Crown Prince Dae Kwang Hyun received the family name Wang (왕,王), the royal family name of Goryeo dynasty. Balhae stands as the last state in Korean history to hold any significant territory in Manchuria (Northeast China), although later Korean dynasties continued to regard themselves as successors of Goguryeo and Balhae. That began a series of northern expansions of later Korean dynasties. The Khitans themselves eventually succumbed to the Jurchen people, who founded the Jin Dynasty. The Jin dynasty favored the Balhae people as well as the Khitans. Jurchen proclamations emphasized the common descent of the Balhae and Jurchen people from the seven Wuji(勿吉) tribes, and proclaimed "Jurchen and Balhae are from the same family." 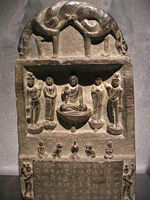 Balhae consorts mothered the fourth, fifth and seventh emperors of Jin. The thirteenth century census of Northern China by the Mongols distinguished Balhae from other ethnic groups such as Goryeo, Khitan and Jurchen. That suggests that the Balhae people still preserved their identity even after the conquest of the kingdom. After the fall of Balhae and its last king in 926, new Khitan masters renamed it Dongdan, who had control over most of Balhae's old territories. Starting from 927, many rebellions errupted throughout the domains. Those rebellions eventually turned into several Balhae revivals. Out of those, only three succeeded and established kingdoms: Later Balhae, Jung-Ahn Kingdom, and Dae-Won Kingdom. Those three kingdoms temporarily chased the Khitan and their Dongdan Kingdom out into the Liaodong peninsula, but the Liao Empire eventually decimated them all. The people of Balhae derived from former Goguryeo people and of several Tungusic peoples present in Manchuria (Northeast China), the Mohe (Malgal) made up the largest element. Heavily influenced by Tang China's culture and government, Balhae modeled its system of government upon that of Tang China, and to an even greater extent than Silla. The government operated three chancelleries and six ministries, modeling its capital, Sanggyong, after Chang'an, the capital of the Tang Dynasty. In addition, Balhae sent many students to Tang China to study, and many went on to take and pass the Chinese civil service examinations. At the end of the twentieth century, an important source of cultural information on Balhae had been discovered at the Ancient Tombs at Longtou Mountain, especially the Mausoleum of Princess Jeong-Hyo. 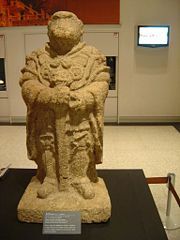 A monkey warrior statue of Balhae at the National Museum of Korea. Controversy boils over the ethnic makeup of the people of Balhae. That a former general from Goguryeo founded Balhae has been widely accepted, but disputes over his ethnicity arise over ambiguous wording in historical sources. Written records from Balhae have yet to be discovered. Koreans, particular from the Joseon Dynasty onwards, regard Balhae as a Korean state. In the eighteenth century, during the Joseon Dynasty, Korean scholars displayed a renewed interest in Balhae. The Qing and Joseon dynasties had negotiated and demarcated the Sino-Korean border along the Yalu and Tumen rivers in 1712, and Jang Ji-yeon (1762–1836), journalist, writer of nationalist tracts, and organizer of nationalist societies, published numerous articles arguing that had the Joseon officials considered Balhae part of their territory, they would not be as eager to "give up" lands north of the rivers. Yu Deuk-gong in his eighteenth-century work Parhaego (An investigation of Balhae) argued that Balhae should be included as part of Korean history, and that doing so would justify territorial claims on Manchuria (Northeast China). How intimate is the connection between Korea and Manchuria? When the Korean race obtains Manchuria, the Korean race is strong and prosperous. When another race obtains Manchuria, the Korean race is inferior and recedes. Moreover, when in the possession of another race, if that race is the northern race, then Korea enters that northern race's sphere of power. If an eastern race obtains Manchuria, then Korea enters that race's sphere of power. Alas! This is an iron rule that has not changed for four thousand years. 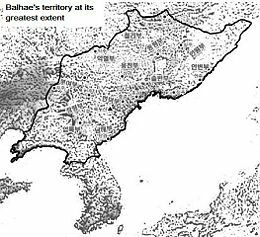 North Korean and South Korean scholars regard Balhae as a Korean state, positioned in the "North South States Period" (with Silla) today, although such a view has had proponents in the past. 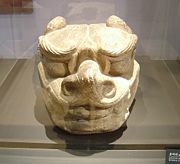 They emphasize its connection with Goguryeo and minimize connection with the Mohe. While South Korean historians think ethnic Goguryeoians comprised the ruling class while mixed, including Mohe, comprised commoners, North Korean historians maintain that people from Goguryeo inhabited Balhae. Koreans believe the founder Dae Joyeong came from Goguryeo stock. The Book of Tang says that Dae Joyeong's comes from Goguryeo lineage " (고려별종, 高麗別種), and the New Book of Tang states that he is "from the Sumo Mohe of the former realm of Goguryeo." The 2005 Korean martial arts film Shadowless Sword, about the last prince of Balhaea, mentions Balhae. A Korean drama, was launched as a mini-series for Korean television in September of 2006, that features the founder of Balhae himself, Dae Joyeong. ↑ Global Oneness Community Encyclopedia article "Bohai". Retrieved December 28, 2007. ↑ "Country Studies: North Korea" U.S. Library of Congress.Retrieved December 28, 2007. ↑ The Encyclopedia of World History. 2001. online  Retrieved December 28, 2007. ↑ Ibid. "Rediscovering Manchuria: Sin Ch'aeho and the Politics of Territorial History in Korea," The Journal of Asian Studies 56 (1) (1997): 30  Sin was criticizing previous generations of Korean historians, who had traced Korean history back to the ancient peoples of the Korean peninsula. Sin believed that by doing so, and regarding "minor peoples" as their ancestors, they diluted and weakened the Korean people and their history. He believed that the Korean race mainly descended from northern peoples, such as Buyeo, Goguryeo, and Balhae, and (re)claiming such a heritage would make them strong. ↑ Mark Byington, "The War of Words Between South Korea and China Over An Ancient Kingdom: Why Both Sides Are Misguided." | date=2004 |  George Mason University's History News Network.Retrieved December 28, 2007. ↑ Ross Terrill. The New Chinese Empire and what it means to the United States. (Basic Books, 2003) online .Retrieved December 28, 2007. ↑ Japan Reference "Nara period." Retrieved December 28, 2007. ↑  (in Korean) Modern Japanese scholars view Balhae as an independent state. Byington, Mark. October 7 - 8, 2004. A Matter of Territorial Security: Chinese Historiographical Treatment of Koguryo in the Twentieth Century. International Conference on Nationalism and Textbooks in Asia and Europe, Seoul, The Academy of Korean Studies. All links retrieved May 10, 2016. U.S. Silla Library of Congress: Country Studies. (Korean) Provinces of Balhae Kingdom in 820. This page was last modified on 10 May 2016, at 16:25.